"SAFETY CAM" system is automatically activated when backing up. It Is specially designed for Bus and Heavy-Duty Vehicle Applications. Includes a 7" Color LCD Video display, Multi-Language, 12-24V, 3 video inputs (AV1, AV2, AV3) Automatic/manual switches and remote controller. Comes with 1 day/night vision color CCD camera with 18 LED's, two cameras can be connected. Includes a 65 ft (20m) waterproof harness. 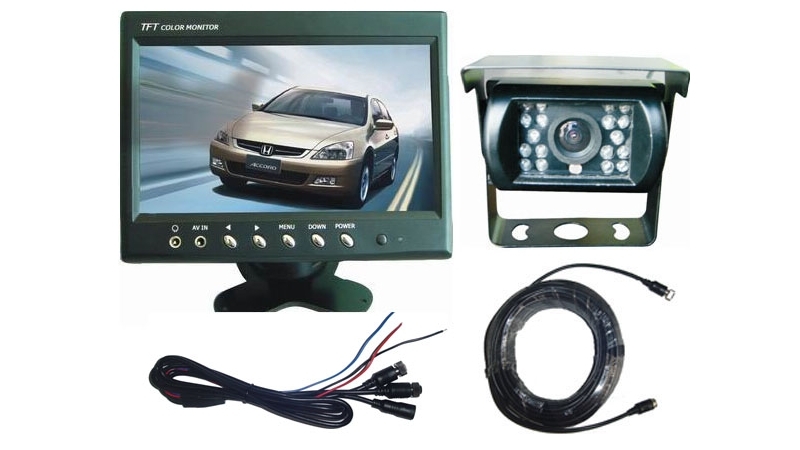 9100-1 - 7" Color LCD Video display, Multi-Language, 12-24V, 3 video inputs (AV1, AV2, AV3) Automatic/manual switcher. 9100-2 - day/night vision color CCD camera with 18 LED's (IP67). 9100-4 - 65 ft (20m) waterproof harness. 9100-5 - Multi-Camera control box. 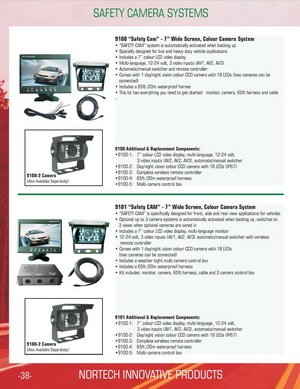 Contact us for information on more Nortech camera options.